National Assembly's Environment and Natural Resources Committee has summoned Tourism Cabinet Secretary Najib Balala to explain how 10 rhinos died at Tsavo East National Park. 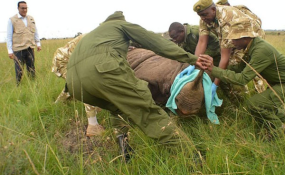 The rhinos died few days after being translocated from the Nairobi and Nakuru national parks, to Tsavo East National Park because of overcrowding in the two parks, which was hindering breeding. The newly-established, 100km2 Tsavo East rhino sanctuary in Kenya's oldest and largest nationalpark was expected to be more suitable for breeding. The committee's chairman Kareke Mbiuki told the Nation the team is concerned about the deaths, warning they will not spare anyone doing injustice to the country's tourism sector. The black rhinos are an endangered species and the loss of the 10 has put Mr Balala on the firing line with Kenyans on social media calling for his resignation. Mr Mbiuki said Mr Balala will appear before the committee to give the country a comprehensive statements and answers of what happened to the Kenya's wildlife animals. "We saw Mr Balala supervising the translocation of these rhinos, he was part of it. So at the end of the day, he cannot [blame] junior officers," said Mr Mbiuki. Mr Mbiuki said there has been conflicting reports regarding the deaths of the rhinos. Mr Balala has so far suspended six senior officers in charge of the relocation and demoted KWS Director-General Julius Kimani. Those suspended are Dr Samuel Kasiki, who was in charge of biodiversity and research, Mr Francis Gakuya, who headed veterinary and capture services, Dr Isaac Leekolol, who was head of capture services, Tsavo East senior warden Felix Mwangagi, Dr Mohammed Omar, who was in charge of ecological and monitoring services, and Mr Frederick Odock, a senior scientist. Mr Balala, however, absolved the ministry from blame, arguing that a fully autonomous technical team is responsible for the programme that is funded by the World Wide Fund for Nature. KWS suspects that the animals died from salt poisoning after drinking highly saline water in their new surroundings.